A trader may show objective vs subjective trading tendencies in relation to the market movementLong and Short PositionsIn investing, long and short positions represent directional bets by investors that a security will either go up (when long) or down (when short). In the trading of assets, an investor can take two types of positions: long and short. An investor can either buy an asset (going long), or sell it (going short).. 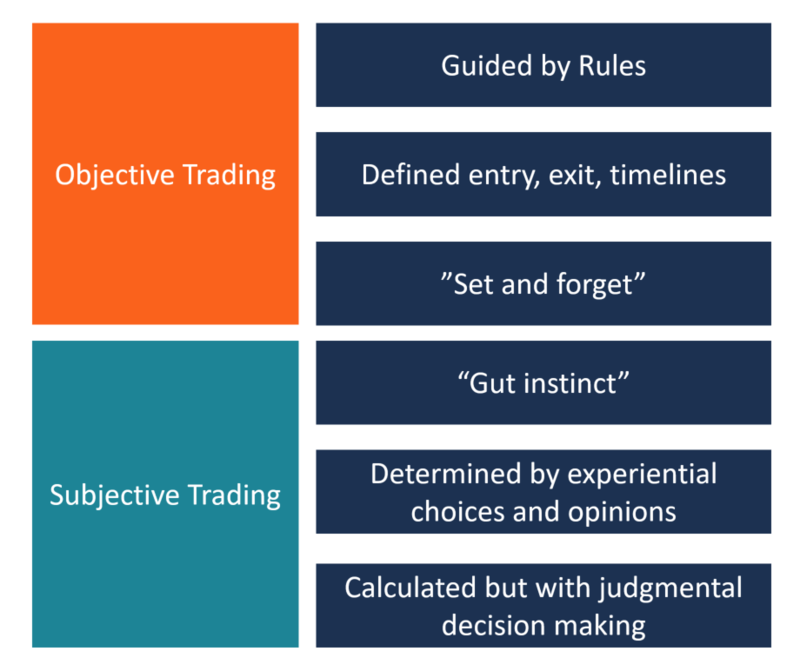 Objective traders follow a set of rules to guide their decisions during the trading. They find it easier to stick to buy and sell decisions that they pre-planned. On the other hand, subjective traders adapt to changing market conditions, and they base their trading on their feelings and opinions about a particular tradeAlgorithms (Algos)Algorithms (Algos) are a set of instructions that are introduced to perform a task.Algorithms are introduced to automate trading to generate profits at a frequency impossible to a human trader. Subjective traders may become biased since they base their trading on emotions and this may negatively affect the decision-making process. While there are disagreements about the merits of objective vs subjective trading, traders should adopt a system and put a trading planResistance LineA Resistance Line, sometimes also known as a Speed Line, helps identify stock trends and levels of support and resistance. Resistance lines are technical indication tools used by equity analysts and investors to determine the price trend of a specific stock. in place. Using a system that you’ve already tested and practiced makes it easier to make decisions in objective vs subjective trading in real time as opposed to using a random trading system. The problem with a random trading system is that the system is untested and trading relies on the ability to make predictions to earn a profit. Traders using a random trading system are subject to errors since they do not put time and research into the system. Objective trading is also referred to as rule-based trading, and it is the simplest way to trade. The trader follows a defined set of rules for entry, exit, time frame, order types and, market that are meant to guide their actions. It is designed to “set and forget,” and the trader lets the charts to progress until a target is achieved or a trailing loss occurs. The trader does not interfere with the progress of the trade until the target is met. Due to the simplicity of objective trading, it is ideal for new traders who are not skilled enough to differentiate between a small move and a large move, as well as read trading signals. A tested and practiced trading system relieves the psychological pressure that new traders may experience when starting out. Objective traders use historical price action, charts, probabilities, and risk management to guide their trades. They follow the price actions rather than depending on the internal emotions that may drive them to make costly mistakes. Objective trading is not adaptable to the current market conditions unless the rules are modified. For example, if profitability falls below average, the system rules may be altered to prevent the decline from going beyond a certain point. Also, short-term trades may not maintain profitability for long periods and may need to be adjusted periodically to reflect the prevailing market conditions. Subjective trading is based on personal feelings, tastes, and opinions about a particular trade. Subjective traders rely more on the psychological feelings than actual price actions. It is common among traders who enjoyed some success in the past, and they can read market signals to know when a gain or loss is likely to occur. In objective vs subjective trading, objective traders use rules, while subjective traders rely on guidelines. Guidelines are pieces of information that give direction, and they allow the trader to alter the plan as new information becomes available. The traders use this information to plan their trade, but the decision they make in the course of the trade is influenced by what they feel about the trade. If they feel bad about the trade, they exit. Since trades fluctuate within short periods, subjective traders must continuously adapt to the changing market conditions in order to realize high-profit margins. They can achieve this by continually analyzing new information to determine its impact on the current and future trades. When the charts show that the price is moving against them, they may exit early for a small profit, or a smaller loss than the trend is likely to bring. The ability to adapt to the changing market conditions, if well conceptualized, may mean consistent profitability than what is earned by objective traders. One of the benefits of objective trading over subjective trading is that the trade is not based on emotions. The trader does not need to stress out on how the charts are progressing. All that a trader needs to do is to follow the plan and only interrupt when an external action is needed. Mechanical trading reduces instances of emotional attachment during trading which may interfere with proper judgment. Rather than monitoring the trade every second, the trader can leave the trade to progress as he searches for alternative markets that allow trading. On the downside, objective trading limits the amount of profits that a trader can earn. The trade progresses based on rules that are specified at the beginning, and the profitability curve solely depends on the rules that the trading system follows. It does not adapt to the changing market conditions as is the case with subjective trading. The subjective trader is flexible enough to adapt to the changing market conditions to make more profits from the trade. When the profitability curve drops to extreme levels, the trader can exit with a small profit or without incurring huge losses. On the downside, the trader is subject to fear because he is invested in the outcome. An objective analysis would be attained if the trader is not interested in the outcome of the trade. But since the trader is involved in the trade, he trades with the hope that the market will do what he wants rather than what is expected based on an objective analysis. Another limitation of subjective trading is that it is subject to greed. The trader relies on his emotions to make decisions, and it may lead to greed to earn more profits. For example, a trader may make a wrong decision but continues to trade because he refuses to admit his wrongdoing and continue to incur losses from an avoidable mistake. Another thing subject to greed is when a trader makes a considerable profit and leaves it to continue trading hoping for more profits.